Much has happened since the day of the yakuza incident. A lot of time has passed. Takamatsu’s determination for me to learn how to protect myself became more intense. 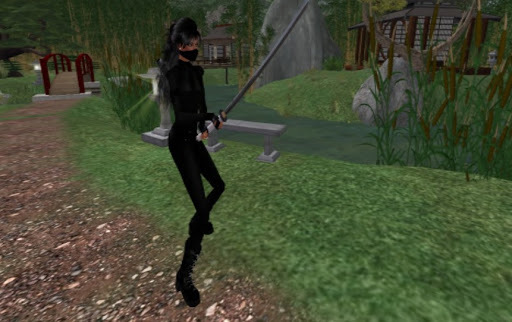 I was so unsure of how to deal with his intent to train me in the use of the katana, a weapon reserved for deadly warriors. I felt myself to be so incapable of learning how to use this weapon and the thought of mastering it enough to defend myself in a fight was unthinkable. However, I knew that a situation may come, and soon, where I’d have to put myself at risk, or be harmed as bad or worse if I did not defend myself. I also felt a responsibility to my little cousin, Koniki who I had put in a situation where her safety and even her honor could be threatened. So it was, that two days later Taka san took me for a visit to the sword makers at Matsumoto Castle. Unknown to me, Taka has already ordered a new swords from the renowned sword maker, the elder Musashi sama. Musashi was to deliver the sword to my husband, and this was the night I was to see it for the first time. We arrived early and took time to enjoy some tea and cake, then moved to the balcony where we discovered my friend Matsumoto had been waiting for us. The sword, an exquisite white katana finally arrived. When I saw it, I felt many mixed emotions. Musashi said, this katana had been created for royalty, but was never delivered. So he placed it in his restricted collection awaiting a patron. He said, this weapon was for protecting someone of great worth and fine qualities. He told me that this katana was meant for me. Musashi sama named the sword in honor of my husband’s love for me, calling it Yordie’s Flame. The man was very polite, delivered his weapon and then left us in a matter of a few minutes. That same night, Taka took me to a small shop in a remote part of the town where he equipped me further. Oddly, he purchased some rather coarse, almost mannish clothes for me. He told me these would enable me to move through our town with a more anonymous persona, thus providing me the advantage of invisibility in plain sight. However, he also reminded me of another outfit he had bought for me, long before we began thinking about the use of deadly weapons. It is and outfit designed for greater flexibility of movement and greater stealth, and it would only be called upon for special training or when faced with great threats. We didn’t stay in Kansai that night, but made the trip to our new lands in Yemple. Early the following morning, Taka and I entered a secluded part of the garden and he instructed me in the use of my new weapon. I had seen the lethality of a katana on several occasions, each time I was terrified, even in tournaments where wooden katanas were used. I had never held a katana. And as I was given the weapon to carry to our training field I could sense it’s power. As always, Takamatsu sama is a great teacher. He drew on the lessons from our first days in Kansai. My training continued for several days. I learned to draw and sheath my weapon. I learned the tactics of confronting a dangerous opponent and how to defend myself first and foremost. Then I learned how to close on the opponent and deliver deadly attacks. My abilities were poor when I started and even tho I could feel the improvements from Taka’s training, I knew I had much to learn. I also knew I’d need a new type of courage. And then, the next day, Taka returned to his daily business. However, I did not return to Kansai. I was drawn to our weapons room on the top floor of our home. I wanted to see my katana, the Yordie’s Flame. I lifted it from it’s case and it felt good in my hands. I did not know where this weapon or this training would take me, but I had mixed feelings of being empowered and being frightened of the kinds of decisions I’d have to make if I should ever have to draw the weapon.